Summer is the perfect time to embrace all that Mother Nature has to offer, and a picnic is just the way to relax and take in all that is good, beautiful and most importantly, free. In any economy and whether you enjoy it alone or with a friend, a picnic can be perfectly MARvelous and tasteful with minimal expense. Apparently, it’s up to me to shed some well-deserved attention on this subject. For me, dining al fresco is a celebration in itself. 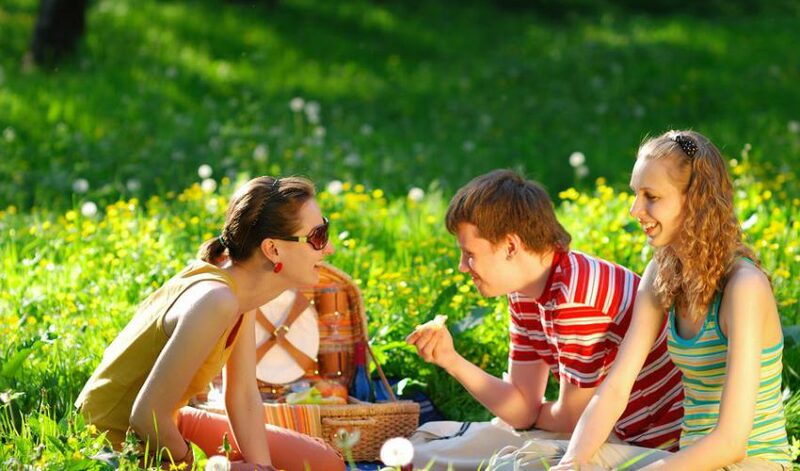 Whether it’s the seaside, a city park, or your very own backyard, any picnic can be a fun and memorable experience. Even when venturing beyond traditional burgers and hot dogs, dining outdoors need not require extensive planning and preparation. In planning the menu, it’s a good idea to start with foods that can be made ahead of time and served either cold or at room temperature. Standards include good ole’ fried chicken, potato salad, and coleslaw. But how boring is this? Let’s think outside the box and get creative with the meal. Fabulous sandwiches, the ultimate outdoor convenience food, need never be dull. Experiment with fillings and vary the bread — try sourdough, black rye, or poppy seed. For example, how about a French baguette with mushroom stuffed tenderloin of beef or grilled vegetables with pesto and cheese enclosed in a hollowed-out loaf of Italian bread. Lobster, the perfect romantic picnic treat can be served in a variety of ways. And who doesn’t love a lobster roll? Cold soups, although not a traditional picnic food, are easy to transport and serve. In anticipation of hot summer afternoons, salads always have a place in the classic picnic basket. But if you want to forgo the food idea, a simple bottle of wine and crackers with cheese and fruit will do just as well. A picnic need not be centered on the food, but rather the intimate time you spend with someone enjoying the great outdoors. A picnic can be a simple lunch break or an evening of fun. Whether you’re alone or with someone the experience and the beauty is the same. This could very well be the easiest and the most rewarding picnic of all when you connect with nature and embrace your life’s blessings. Here one can reflect overlooking inspiring beauty. I love to keep a beach chair and blanket in the trunk of my car from April to November for a spontaneous picnic. At a moments notice, I can rifle through my refrigerator, grab a snack and be on my way. Or if I’m out I can quickly pick-up a salad and head for the beach. If you’re not hungry, forgo the meal and grab a newspaper. Sometimes all you need is some one-on-one time with yourself to stimulate your senses and recharge the soul. Containers with tight fitting lids are the packer’s best friend. To save space and prevent food from drying out, choose one that most nearly matches the shape and size of the food you are packing. A cake pan (with a cover) lined with wax paper is a great alternative. Sandwiches, pre-sliced food, pÌ¢tÌ©, and cheese should be wrapped in wax or parchment paper, and then tightly in plastic wrap or aluminum foil. Cover awkwardly shaped dishes on the top and from the bottom with foil or plastic wrap, pack securely and always at the top of the picnic basket or cooler. Picnic drinks are heavy and may be awkward to carry for any distance. Keep this in mind when selecting your beverage. Follow the heavy to light rule of thumb. Place the heaviest items on the bottom of your basket or container. Fill it so the items you’ll need first are packed last. Place the tablecloth or grown cover on top so it can act as a protective and decorative lid. In addition to a nice bottle of wine, I always pack a bottle of mineral water, which I serve with slices of lime or lemon. Years ago I was very lucky to find a wonderful vintage thermos in my grandmother’s attic. I now use this for iced tea or coffee. A new or old thermos is a classic accessory to any picnic. For those who prefer to dine outdoors around a table, a “picnic cabana to go” should be added to the list of supplies. Collapsible picnic tables complete with folding chairs can be found at many stores or online. However, I never go this route. For me, a picnic is all about getting close to Mother Nature. Sitting on the grass or sand enhances the overall picnic experience. Plastics have been elevated to a new place in the home. While not the greenest option, some plastic is designed for temporary and disposable use making it possible for picnickers to affordably change plate patterns to suit just about any occasion. However, if you choose the disposable option, make sure the plastic is biodegradable. Many of today’s lightweight materials are designed to be reused and should be. Here is where one can really have some fun and be creative. No matter what the occasion, plastic is perfect for any picnic. Besides plates, mugs, tumblers and stemmed glasses, plastics and other recycled materials are the waves of the future in coolers, baskets, etc. While I totally understand the need for glass stemware for a romantic picnic, one should always keep in mind that transporting glass requires extra care and safety. After all, drinking champagne from an acrylic flute is okay, but sipping out of a crystal glass is something else entirely. The only catch is making sure it doesn’t get broken en route. Packing glasses isn’t nearly as traumatic as one might think. Simply wrap each glass individually with a dishtowel or cloth napkin. Fit them snugly, but not tightly into your basket, obviously on the top. When the weather’s right and you’ve had your fill of table service, there is nothing quite like eating al fresco on a grassy patch or park bench with the one you love. Romantic picnics should come from the heart and require special attention to detail. A sunset picnic at the beach with candles can inspire your lover. Less is more here and it’s all about the company, the food, and the presentation. Take the time to select your favorite romantic foods. Mine include fresh strawberries, shrimp, and yummy cheeses. Lobster salad and caviar are also wonderful romantic treats, easy to pack and takes the classic romantic picnic to a whole new level. Then, for the final touch of elegance, present a pretty dish of orange slices or strawberries dipped in dark chocolate, with champagne of course. For this romantic occasion, I see no reason why one shouldn’t eat from proper plates, drink from proper glasses and eat with proper flatware. I like to use a crisply laundered blanket and cloth table napkins. When it’s just the two of you, the menu can be as simple or elaborate as you like. Cut flowers or foliage from the garden tied onto napkins with raffia or garden string, add color and interest. I personally enjoy an appetizer picnic in the garden as a prelude to a dinner reservation. Candles and rose petals can lead you to this special place in the garden. This creates the perfect setting for love and romance. In the garden, I can set the stage for that special someone. Today’s modern picnic can be as simple as a bottle of wine or champagne and two glasses shared at the beach or in the garden. This is a personal choice. Some people prefer baskets and others coolers. But this really depends on the time of year. In the dog days of summer, food should be kept on ice and a cooler is preferable. On beautiful spring and fall days, any basket will do. Seek out interesting baskets that can have multiple uses. Tag and garage sales are great for discovering the perfect picnic basket. I use a vintage suitcase that is unique, and it allows me to be well-organized.